I have a few dear friends going through some very challenging experiences. I know they will be fine and find their way. These two friends are both very powerful, each in their own way. They do not know each other but their experiences are similiar. I see them shedding the layers of other people’s judgement and releasing the pain of other people attempting to shame them and discredit them. I see them making tremendous strides forward, where others thought they would fall. I see their beauty, their wholeness, and their joy. I hold them in this light. This post is dedicated to both of them. It can be hard to watch our loved ones go through perceived battles in their lives. The reason that I say, “perceived battles,” is because these painful experiences do not last. It may seem like a “battle” but in my opinion, it can turn out to be a gift. Albeit, it does not feel like a “gift” when one is attempting to cope during very trying times. However, I know if one can find the strength to keep going, one day at a time, the hardest experience of your life can later turn out to be the greatest blessing. But, it may take time, patience, tears, constantly picking oneself up, and lots of self-soothing along the way. Finding strength that one did not know was possible becomes the norm. It’s a form of alchemy of the mind, transformation, and ultimately evolving into a new sense of self. During this process, some people will not see the changes you’ve made. They will not see nor understand your transformation. Basically, they may not trust you nor see your worth. Honor them, love them, but let them be. It’s as if yearning for approval, only pushes others away. We will never understand why some people do not like us. We cannot shine brightly enough to reach people who have imposed their limiting perspective on us. Sometimes those people are somewhat of outcasts themselves, yet they too judge without knowing all of the facts. Sometimes those people are religious or spiritual people, who proclaim compassion and mercy. Yet they do not offer it to you. It’s okay. It’s just fine. Honor them, love them, and let them be. Your value and your worth are not determined by others. It is an intrinsic knowing of the worth and value of all human beings. If someone does not “vibe” with you, don’t try to force it. Don’t try to prove anything to anyone. Love yourself, hold your head high, and always take the high road. Being kind to all others, offering uplifting words, and doing your best in all situations will ultimately speak for itself. Actions always speak louder than words anyway. Plus, there are many more people who love you, adore you, and appreciate you beyond measure! Keep your focus there. ❤️ Keep your thoughts on anything that uplifts you. Know you are a beloved child of the universe! Know that you are worthy of your dreams coming true and you deserve the best! Live your best life. 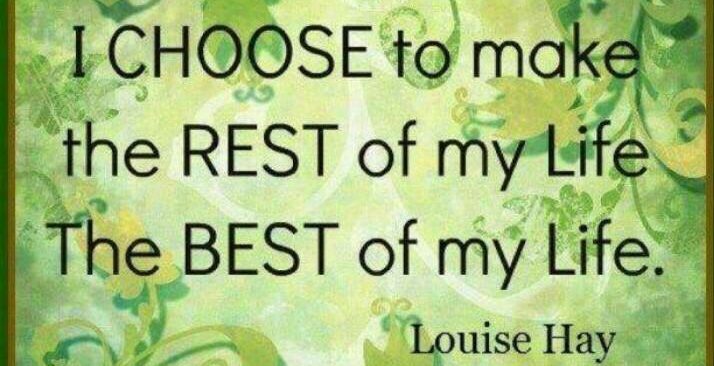 Give your best to yourself, to your family and friends, and to the world! There will come a time when you no longer desire to look backward. It does not serve you to rehash the past. Forgive yourself and all others for past experiences. Set yourself and others free from any painful experiences. Forgiveness is a gift to yourself. Those experiences cannot be changed and hold you down. Today and tomorrow is where the life-giving adventure is at! Dream big! Do not be afraid to live large! Do not be scared to move forward. There is no need to rush and definitely no need to worry. My most important piece of advice is to constantly look for things to appreciate. Make lists of positive aspects in your life as often as possible. Train yourself to look for the good in your world. It is the easiest way to shift your own perspective of yourself and your life. Appreciation transforms everything! I recommend that when you wake up each morning, start appreciating right away (the comfort of your bed, the pillow beneath your head, the day ahead, everything that you can think of). That behavior will set the tone for your day. Then continue to appreciate and bask all throughout the day, every day. Before you know it, you will find that you have shifted into a new way of living and experiencing life. So very true. I received my biggest dose of freedom (feeling free) when I released the need for anyone else’s approval. I know what I’m doing and can be confident in my decisions because source has my back. It is so much easier to live this way.